Membership of Henley Sub Aqua Club is currently £40 per year. This is in addition to the BS-AC annual membership charges of £36 - £52 (depending on grade). Henley Sub Aqua Club and BS-AC membership fees are due each April for the year. Trainees for Ocean Diver training pay a total of £242 in the first year that includes all training fees, membership fees and equipment loan. We organise regular try dives for people to have a go at diving. These are held either at Crosfields School in Reading, or at Gillots School in Henley. We provide all the kit, all you need to do is turn up with your swimming costume and a towel. Please see our calendar for forthcoming dates, or contact us. If you’ve always wanted to learn how to dive, this course is for you. This course is for beginners and provides the essential knowledge and skills needed to prepare for open water diving. A basic level of comfort in the water is important and you will have to demonstrate that you can swim 200m in swimwear. 1. 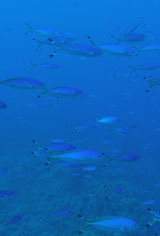 Seven lessons and a (multiple-choice) theory assessment on the basic principles of scuba diving. We can schedule these lectures over a series of weeks, or can organise longer sessions to get through several in one go depending on preference. 2. Five confined water dives to learn the basics in the water, familiarise yourself with the kit and begin to develop your underwater skills. These sessions are typically at Crodfields School in Reading on either a Monday or Thursday evening. 3. Five open water dives to further develop your scuba diving skills. These are undertaken in relatively sheltered locations. Favourites of the club are Stoneycove (near Leicester), Wraysbury Lake (near Heathrow) and Swanage. 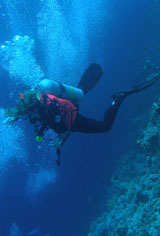 Once you have completed the course, you are qualified to conduct dives to a maximum depth of 20m. You may with another Ocean or Sports Diver in conditions which you have experienced before, or with a higher grade of diver to expand your experiences. 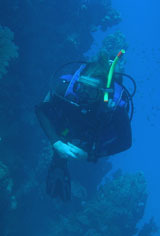 We provide you will the diving equipment that you need for the training. Please bring swimwear and a towel, you may also find a t-shirt helps make the kit more comfy. You may wish to buy your own mask and snorkel, if you visit one of the local dive shops (See the Links page) they will be able to help you. If you are a PADI qualified (or other agency divers) diver, you can dive with BSAC. No cross-over training is required if you hold a recognised qualification, although you can if you want to! It doesn't matter who you trained with (recreational, commercial or military), where you dived or if you haven't dived for a few seasons! We can organise refresher and dry suit training for you if appropriate. We also welcome instructors who have trained with other agencies. There is a straightforward induction process which recognises instructor qualifications and accreditation, please contact us to discuss.